A midwife at the Akassato community health center in Benin, Vivienne Alofa has been trained through the PRIME II Project in active management of the third stage of labor (AMTSL), an intervention designed to reduce postpartum blood loss and prevent postpartum hemorrhage. Alofa’s training is part of PRIME’s strategy to reach more people with key family planning and reproductive health services by building the capacity of primary providers. Approximately 130,000 women die each year from postpartum hemorrhage, making it the leading cause of maternal mortality worldwide. The problem is especially acute in developing countries, where women often deliver without the presence of a provider trained in the prevention or management of complications. In collaboration with ministries of health, professional associations, and partners Management Sciences for Health/RPM+, the American College of Nurse-Midwives and JHPIEGO, PRIME II is implementing a USAID-funded special initiative to prevent postpartum hemorrhage in Benin, Ethiopia and Mali. The initiative is also being implemented in Zambia by JHPIEGO. Most cases of postpartum hemorrhage occur during the third stage of labor, after the baby has been born. Recommended by the World Health Organization as a best practice for all vaginal deliveries, AMTSL brings about safer and faster delivery of the placenta through administration of oxytocic drugs within the first minute after birth, controlled umbilical cord traction with counter-traction to the uterus, and massage of the uterine fundus through the abdomen. Implemented at seven pilot sites in Benin, eight in Mali and 24 in Ethiopia, PRIME’s special initiative work has trained more than 250 providers in AMTSL and related areas including birth preparedness and complication readiness counseling, infection prevention and oxytocics storage. Providers have expressed appreciation for the birth planning component as it helps to relieve other areas of stress in their work—women in labor who arrive at the facility dangerously late due to transportation problems or show up without money to pay for services. While the special initiative is still in the preliminary stages of implementation, early results are encouraging. 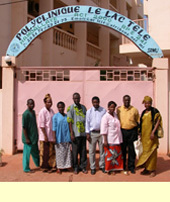 At the Commune V reference hospital in Bamako, Mali, for example, providers finished AMTSL training on April 23. Over the next three months, 1228 vaginal births were recorded at the hospital, with application of AMTSL on 1155, or 94%. So far no complications resulting from AMTSL have been reported at any of the pilot sites. The intervention has proven remarkably safe and effective even for complicated births such as the severely anemic woman who delivered at Commune V after having already bled during her pregnancy. PRIME Voices #22, Benin and Mali: Preventing Postpartum Hemorrhage, 8/26/03.